Sweet, spicy, and oh so addictive. 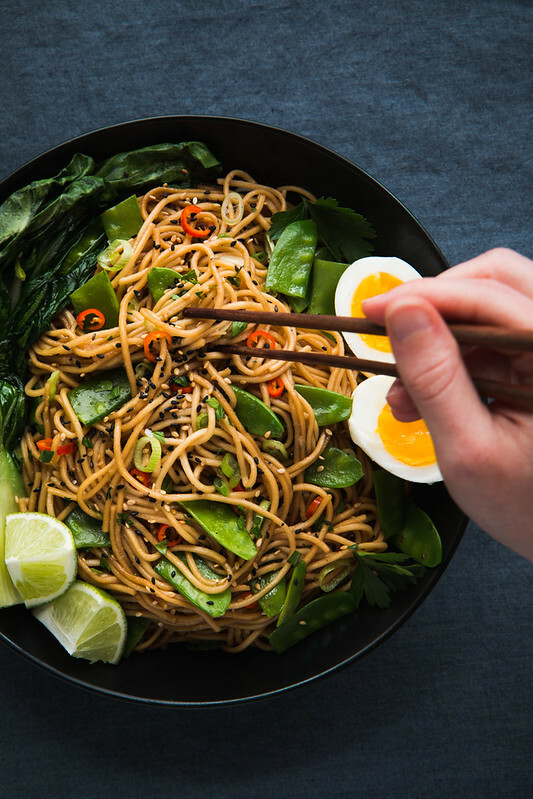 These Asian chili garlic noodles are a must in your weeknight dinner repertoire. 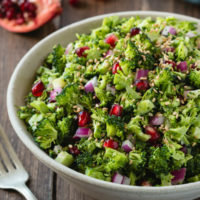 Jump to the recipe here, or read on and get the recipe at the end of this post. What is it about noodles that make them so irresistible? Take that beloved classic and add some sweet, salty, spicy, umami flavors, and now we’re really talking. Truly, these are no ordinary noodles. I don’t know about you, but around here we fall into a rut when it comes to pasta. It’s so simply to make, it ends up on the table at least once a week, which means we get into the habit of automatically making the same thing over and over again. Spaghetti and meatballs, butter and parm, mac and cheese… all good, don’t get me wrong, but it’s nice to break the cycle and mix it up sometimes. Enter, Asian Chili Garlic Noodles. Just like regular noodles, only so much better. Uber noodles. They go to eleven. They are legen… wait for it! What I’m trying to say is, you should make them. They are just as fast and easy as any other pasta, and most of the ingredients are probably already in your pantry. As for the veggies and add-ons, you can mix those up however you’d like. I’ve been obsessed with baby pak choi lately, so that was a must for me, and nothing says spring like fresh peas… but you could just as easily use bell peppers, mushrooms, little broccoli florets, or any other veggies you have lying around. You can even leave off the egg, and make the whole dish vegan (details in the recipe notes). There’s just one thing that takes a bit of fine-tuning, and that is finding the right level of heat for your tastes. Some like it hot. Some not. 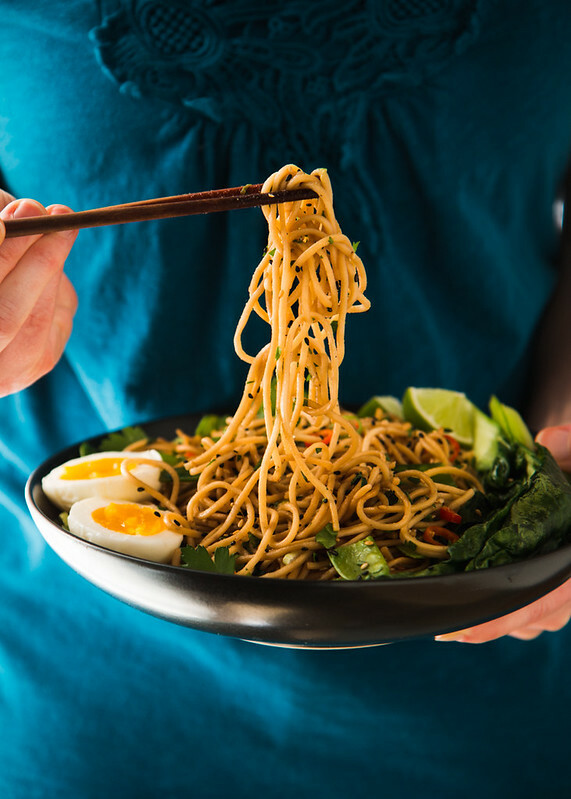 Whichever camp you fall into, these noodles have you covered — I’ve included tips in the recipe notes for how to control the amount of heat, and once you’ve got the hang of it you’ll be able to tailor it to fit your tastebuds, or your mood. Really, there are only two rules when it comes to this recipe: 1, try not to over-cook your noodles, and 2, if you’re wondering how hot a bird’s eye chili is, do not chomp down on one (nibble — always nibble). There are your words of wisdom for the day. Now go, my young padawans. Make noodles. 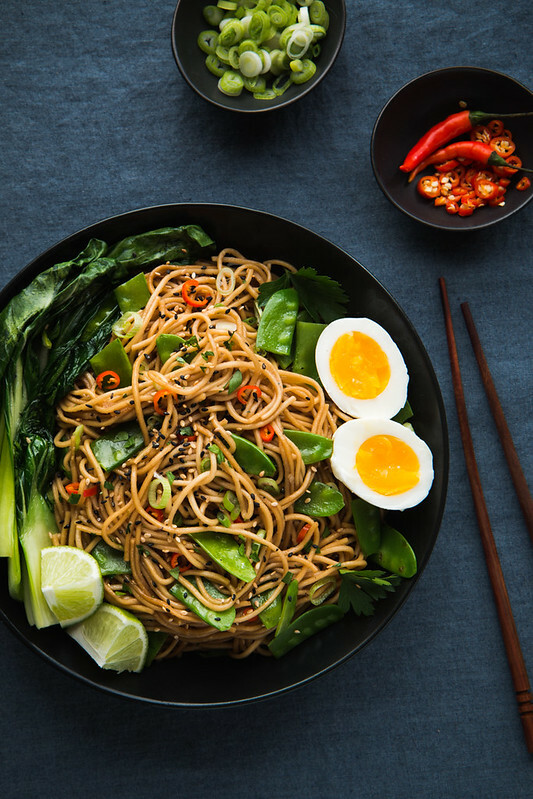 Make sweet, spicy, glorious noodles that will kick your weeknight dinner routine into the realm of amazing. What’s your favorite go-to weeknight meal? Let me know in the comments below! Start by making the sauce. Add everything to a bowl or glass measuring cup, and whisk to combine. Set aside, and allow the chili to infuse the sauce with heat. To adjust the amount of heat in the recipe, see the recipe notes below. Cook the noodles according to package directions, minus a minute or two -- they should be a little chewy still -- and drain them. Set aside. In a wok or large non-stick skillet, heat 1 TBSP of oil. Cut the base off the pak choi and separate the leaves, and once the oil is hot, add it to the pan. Let cook for 30-60 seconds, then add in the snow peas, and cook for another minute or so, until bright green and crisp tender. Remove from the pan and set aside. Add another 1-2 TBSP oil to the pan, and add the garlic and ginger. Cook for 30 seconds, stirring constantly to keep the garlic from burning, then add in the cooked and drained noodles. Toss thoroughly to coat the noodles in the garlic and ginger, letting the noodles fry a little in the pan, then pour the sauce into the pan, and toss to combine. The noodles will absorb the sauce quickly -- if they become too dry, add a splash more water, as needed. Add the cooked vegetables, green onions, cilantro, and sesame seeds to the pan, and toss to combine. Serve immediately with additional sesame seeds, and fresh limes wedges for squeezing over. *Birds eye chilis are very spicy. For maximum heat, slice them whole. 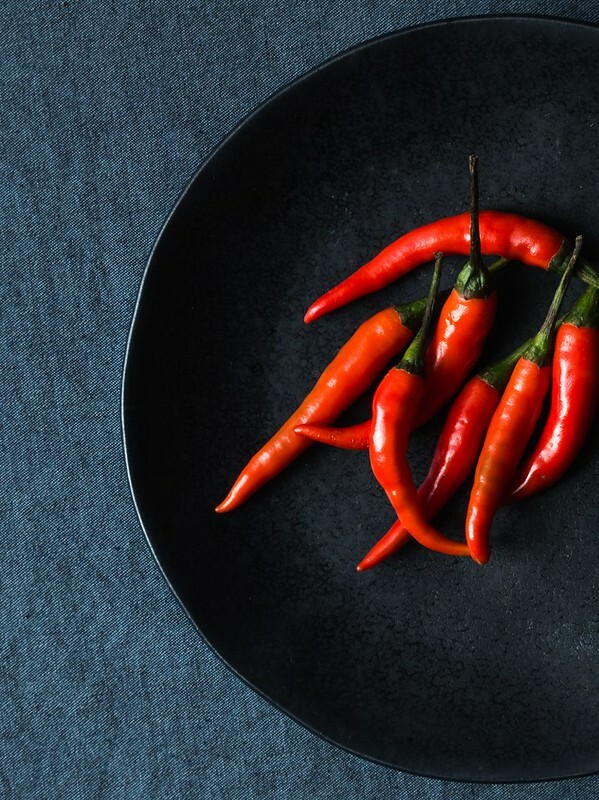 For a milder heat, cut lengthwise down the middle and scrape out the seeds and veins using the edge of a spoon, or the tip of a paring knife (I recommend wearing nitrile gloves whenever handling hot peppers so you don't have to worry about getting chili oils on your hands). Discard the seeds and slice the peppers very thinly. After the peppers have steeped in the sauce, you can leave them in and toss them with the pasta, or strain them out just before adding the sauce to the rest of the dish -- they'll still infuse a little heat. 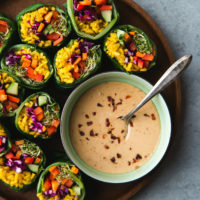 Alternatively, if you can't find or would rather not use fresh chilis, you can simply add some crushed red pepper flakes to the sauce, or a little chili garlic paste, or sriracha -- whatever you have on hand will do. Add a little to the sauce, then taste and add more as needed. You can make the noodles as mild or spicy as you'd like. **If you want to add an egg, or other protein to the dish, I suggest cooking those first. For shrimp, chicken, beef, tofu, etc., heat an additional TBSP of oil in the pan, and cook the protein. Remove it from the pan, continue with the recipe, and add it back to the noodles at the end of cooking, or pile on top of bowls before serving. Recipe can be easily made gluten free (use gluten-free tamari, and gluten-free noodles of choice), or vegan (use brown sugar in place of the honey, and if you're using sriracha or chili garlic sauce in place of the fresh chilis, look for one that doesn't contain any fish sauce). Recipe adapted from Dennis The Prescott (find his recipe for honey garlic noodles, HERE), and inspired by Vermilion Roots (find her soy sauce stir-fry noodles, HERE). I’m a sucker for Cilantro and Garlic. This looks darn tasty! Thanks Mica! Same here, and these noodles really hit the spot! 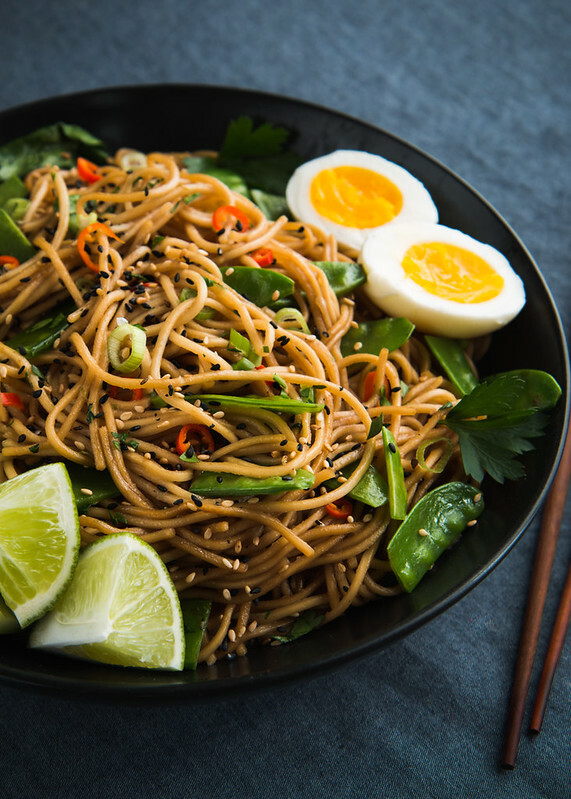 You are so right about noodles and kids….but then again, they are my favorite too :-) This dish looks incredible with those big bright photos. Thanks Sam! I hope you get the chance to make them! I vote noodles over rice any day! Such great flavors working in the dish. Thanks, Jamie! I love me some rice, but I have to agree — noodles for the win! This looks INCREDIBLE. It’s making my stomach growl, and 2.0 hasn’t come home for dinner yet. Also, I can eat my body weight in pasta. I’m not exaggerating. People say I should take my talent on the road – it’s that amazing. That IS impressive. Now I’m trying to imagine what my body weight in noodles would look like… would it fill a bathtub? Because a bathtub full of noodles would be amazing! Oh yeah, that’s a major concern! They are so easy to make, it’s hard to resist! 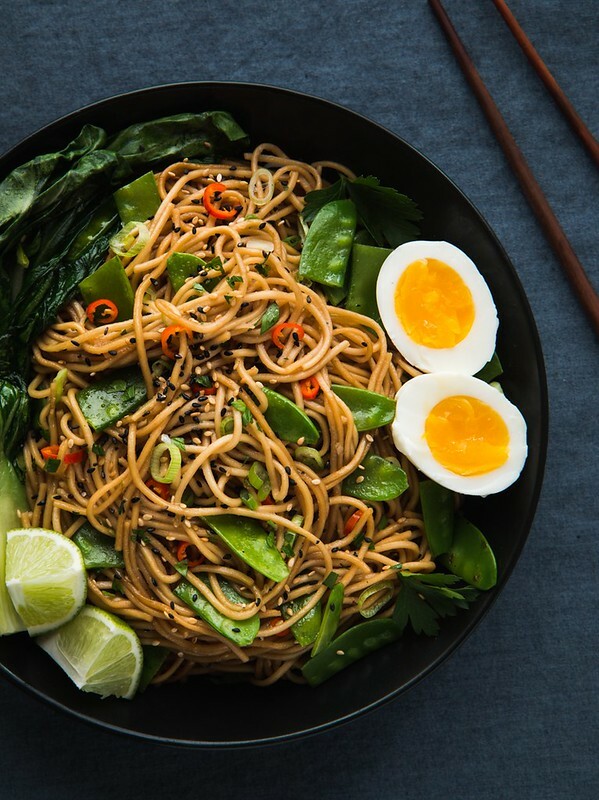 I love, love, love Asian inspired noodles! I could probably eat them all day, everyday. This recipe looks uber easy to make. Can’t wait to try them! Thanks, Amber! I hope you do! My name is Karly and I, too, am a serious noodle head. I’ll do anything for a good, tasty bowl of noodles, and I need these in my life. Like, now! So it’s like 6 am and now i’m super hungry for these noodles. Which seems ridiculous, I know, but i’ll totally eat something dinner-like for breakfast, especially if it’s Asian. It’s just my way. Haha, that’s what you get for reading food blogs first thing in the morning! I’m guilty of the same thing — I just read your latest Feast article and I am seriously craving that chicken and peanut dish! I don’t care if it’s breakfast, I want it! The photos make me want to eat the noodles right away!! What would you recommend instead or mirin, or is it necessary for the recipe? Thanks, Piyusha! You can definitely make it without the mirin — you can substitute it here with some white wine, sake, or just plain water, plus another tsp or so of honey to make up for the sweetness of the mirin. If you use water, I would also add just a few drops of rice vinegar, or white wine vinegar. I hope that helps! Thanks, Adina! I hope you (and the kids) like them! I love the combination of chili and garlic. This dish is perfect for dinner and I bet everyone will love it! Chili and garlic = soooo good, right?! Definitely a crowd pleaser!